Private 1665 Alfred Alexander BURT, V.C. 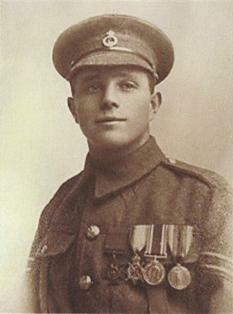 Alfred Alexander Burt was born on the 3rd March 1895 and was a resident of Port Vale in Hertford, Hertfordshire. He was a gas fitter for the Hertford Gas Company before the war and joined the Hertfordshire Regiment as a part time, Territorial Force soldier in 1911. Private Burt was mobilised with the battalion on the 4th August 1914 and, following initial training in Romford and Bury St. Edmunds, went to the Western Front with the battalion on the 6th November 1914. He served with them throughout the first uncomfortable winter in the trenches, surviving the constant patrolling and raiding as well as their involvement in the Battle of Festubert in May 1915. 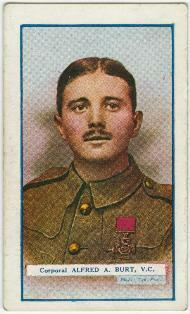 It was during the Battle of Loos in September 1915 that Alfred Burt, by then a Corporal, won the Victoria Cross. On the 27th September 1915 the battalion were lined up in their trenches waiting to go 'over the top' near Cuinchy. Their section of the line came under heavy machine gun fire, forcing even more men into their already crowded trenches. Just at that time, a German Trench Mortar barrage hit them and an incredibly powerful 'minenwerfer' shell landed in their midst. It did not explode immediately so, without thought, Alfred ran to it, held it firm with one foot, pulled the fuse out and threw it over the parapet before it could explode in amongst them. It was estimated that his selfless actions saved the lives of 20 or more of his comrades. Corporal Burt was presented with his Victoria Cross by King George V at Buckingham Palace in March 1916 and continued to serve on the Western Front, rising to the rank of Sergeant, until his battalion were disembodied in 1919. After the war, Sergeant Burt was one of the Honour Guard during the internment of the Unknown Warrior on Thursday 11th November 1920. The Guard, which included many VC holders, are shown in the photograph below. Alfred Burt died on the 9th June 1962 at Tindal General Hospital, Chesham, Buckinghamshire, aged 67. 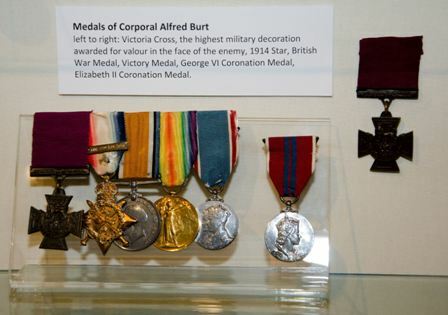 His medals were presented to the Hertfordshire Regiment Museum in Hertford by Burt's daughter in 1979 and are now on display in the Hertford Museum.